By good fortune, I was invited to a Javanese wedding where the niece of my sister-in-law, Nies, got married in sumputous style. Surrounded by fabulous flowers, rich fabrics, and bling, I felt like an an ‘extra’ in an exotic production of Midsummer Night’s Dream. The bride made a stunning Faerie Queen. The groom looked like ‘Puck’, with golden fawns’ ears on his hat, though I understand now … they are wings, not ears. In conversation with the bride’s brother-in-law after the wedding, he suggested that I check the website of Indonesia’s embassy in London for events in the UK. 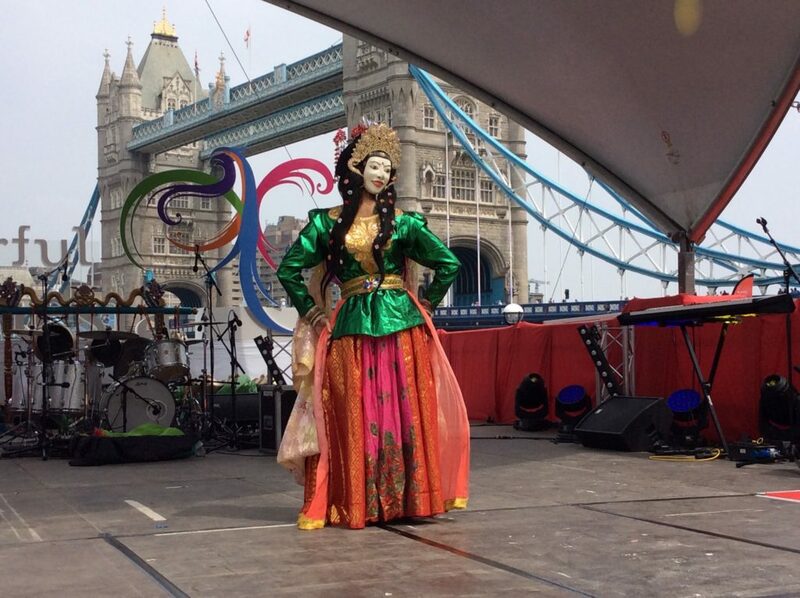 We ‘Googled’ the embassy, and discovered there was a festival of Indonesian culture, art and fashion near Tower Bridge, two weeks after my return. Reading the lineup of artists, he was surprised to see Didik Nini Thowok was performing. He said “ Didk Nini Thowok is the two-face dancer. He’s very famous. If you have a chance, you should try to see him”. So, I did. The dancer, Didik Nini Thowok, is elegant, lithe, flirtatious, and funny. And he is unique, performing as his own creation. He has found his ‘right livihood’ by turning himself into a – double-sided – artform. How many hours of practice, in front of a mirror and training body memory, were needed to master movement from both sides? Didik Nini Thowok has combined the precise, micro-movements of Indonesian court dance with other forms of dance and theatre, such as the tradition of the Onnagata, the men playing female roles, in Kabuki. 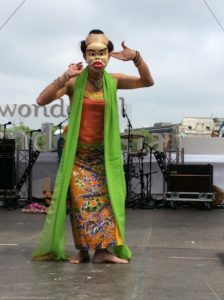 At London’s Indonesian Weekend festival, Mas Didik did the two-faced dance using character masks front and back. Front was a colourfully dressed Indonesian girl and the reverse, a plump-faced Geisha. In addition to the two-faced dancer, Mas Didik has created a number of other affectionately and wittily observed characters. Grandma still shakes a tail feather, if somewhat arthritically. And as Quentin Crisp and Donald Carroll advised in their book – ‘On Doing it With Style’ – she doesn’t give a stuff what the ‘youngins’ think. Monkey is cheeky, challenging you to say she is not a beauty. Didik Nini Thowok performs on an undecorated stage. Between costume and character changes, he turns his back to the audience, kneeling in front of a large chest full of clothing and props. He lets the audience catch a glimpse as he transforms himself – with a wig, a mask, a scarf or enormous glasses. He shows how easy transformation can be … which is the artist’s ‘magic’. There is no hiding. Sometimes, at the end of the performance, he even undresses in front of the crowd. 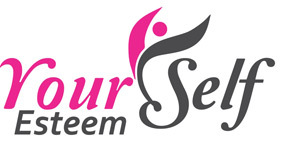 Off comes the corset and the well-fittted bra. In a TedX talk, Didik speaks openly about being a cross gender dancer, and how his focus on following his own path helped in overcoming discrimination. Alongside social and political change, he has dealt with particular challenges — he is of mixed Javanese and Chinese ancestry, was raised as a Christian, and from a young age, was aware of being transgender. In each case, the ‘o-meter’ of tolerance in Indonesia has wavered, when — as in many parts of the world including the UK — being in the wrong place at the wrong time could have consequences ranging from dangerous to fatal. Listening to Mas Didik speak of his life and his art, the phrase ‘Grace Under Fire’ comes to mind. He has mastered the graceful, infinitely complex movements of Indonesian dance, and performing, he holds the stage alone. Didik Nini Thowok created the space in which he dances, as a place for ‘becoming’, separate from external judgement or discrimination. For his art and his integrity, Indonesian people – and others whom he has met – love him. As Mas Didik says “Where there is love, gender is not an issue”.